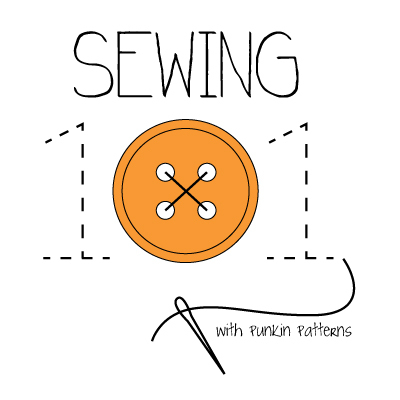 My mom taught me a lot about sewing and embroidery, but she also taught me a great deal about floral arrangements. For many, many years, my mom made wedding bouquets and funeral swags while working at Bachman’s. She’s very good at it — you can see some of her wonderful arrangements in some of my wedding photos I have shared in this post (all the flowers there are real, not silk). She did all of the flowers for my wedding — all of the bouquets and flowers at the church and reception (including all of the table arrangements). They were all so beautiful. Over the years, I learned a great deal from watching her and as I got older, I helped her too. 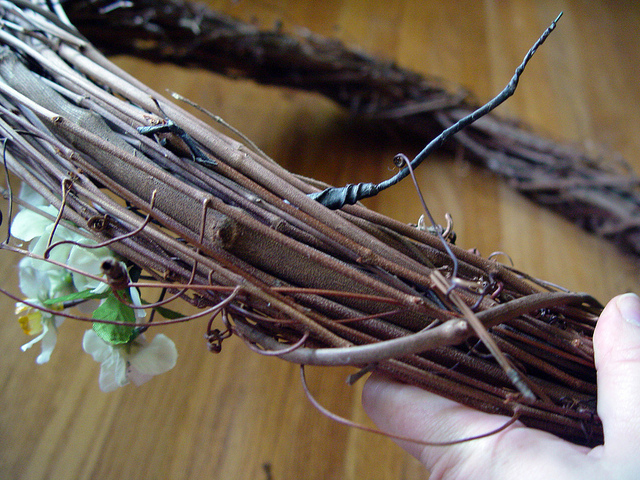 Since I was making a wreath for my new patio, I thought I’d share a simple technique which is very useful in floral arranging — how to wire a flower. 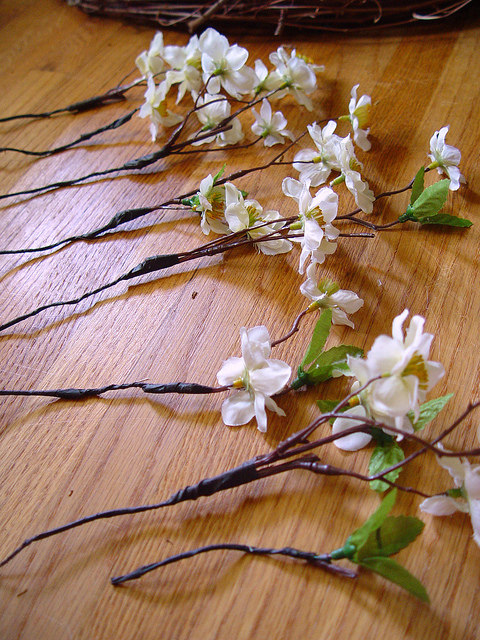 Wiring flowers is very simple and it makes floral arranging very easy. Once a flower is wired, you can make it sit exactly where you want it to and it won’t move. You can use them in bouquets, on wreaths, table settings . . . the list goes on. 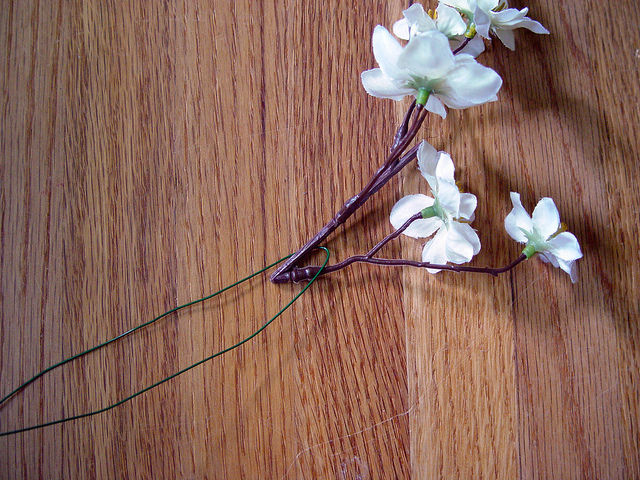 You can wire both silk and real flowers. 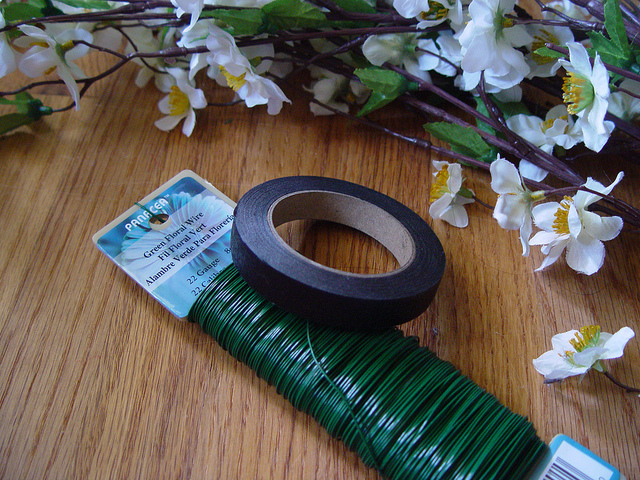 Floral tape comes in three main colors: white (typically used in bridal bouquets), green (for most projects – to make the “stem” look green), and brown (used when you want the stem to look more woody). 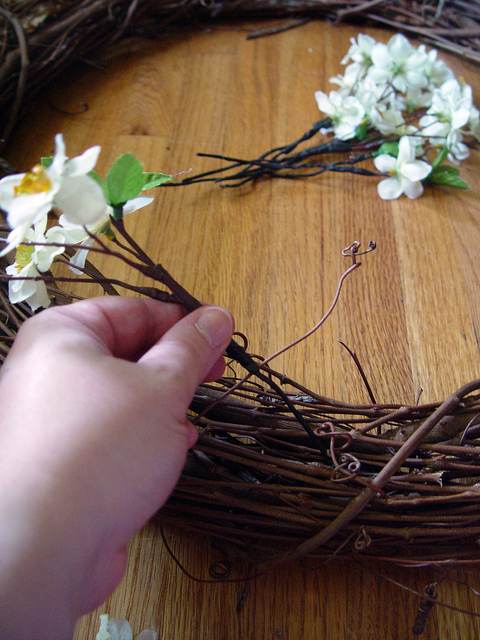 Since I’ll be attaching my flowers to a grapevine wreath, I’ll use brown floral tape. You’ll need some floral wire too. I used 22-guage. It’s a nice balance between being strong and flexible (i.e. easy to use). You can get it in a spool like this and simply cut what you need or you can get some more expensive pre-cut pieces. 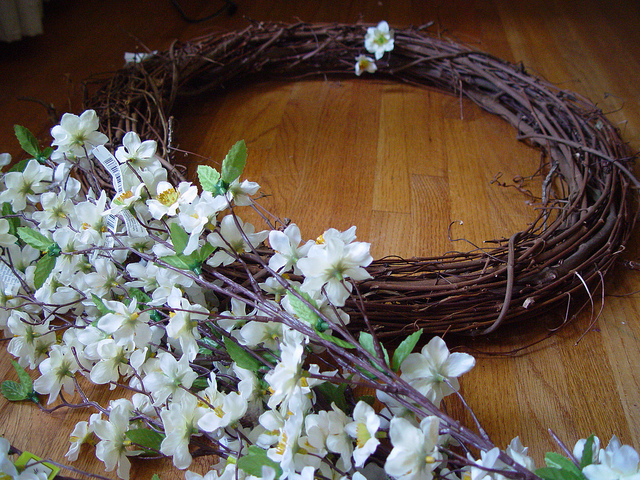 I’ll be using some simple silk flowers and a 24″ diameter grape vine wreath. 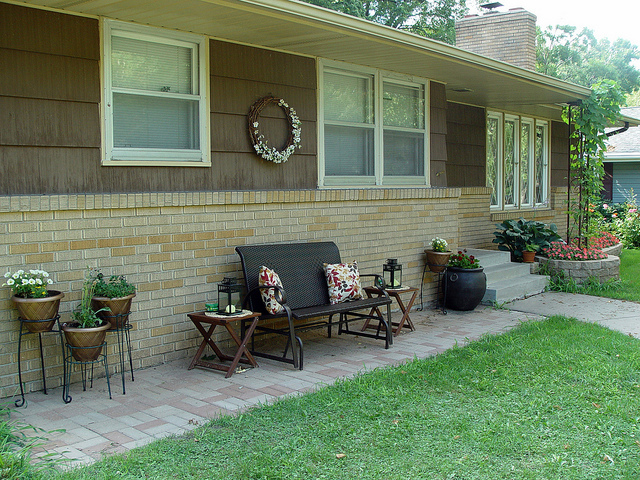 Cut your flowers into small groups (or single flowers if they’re large). 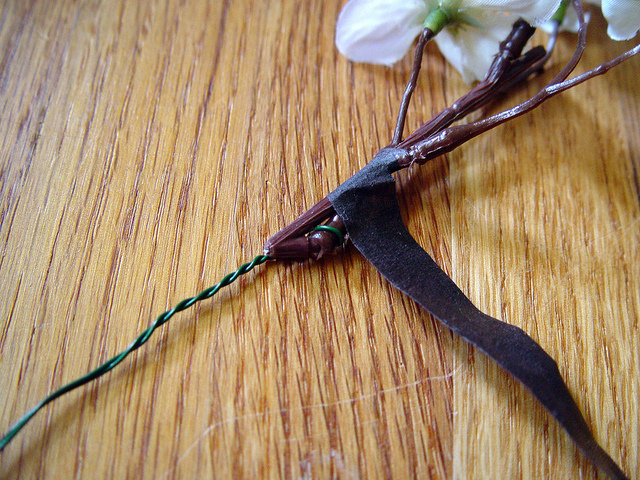 Using wire cutters, cut a piece of wire (about a foot in length) and loop it around part of the stem. Twist the wire around the plastic stem to secure it. Grab the floral tape. Floral tape is very tacky. 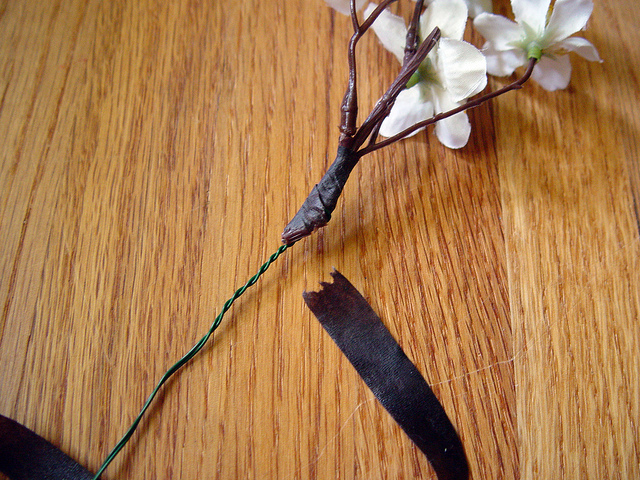 When you’re starting to wrap your flower stem and wire in floral tape, you should start above where the wire is. 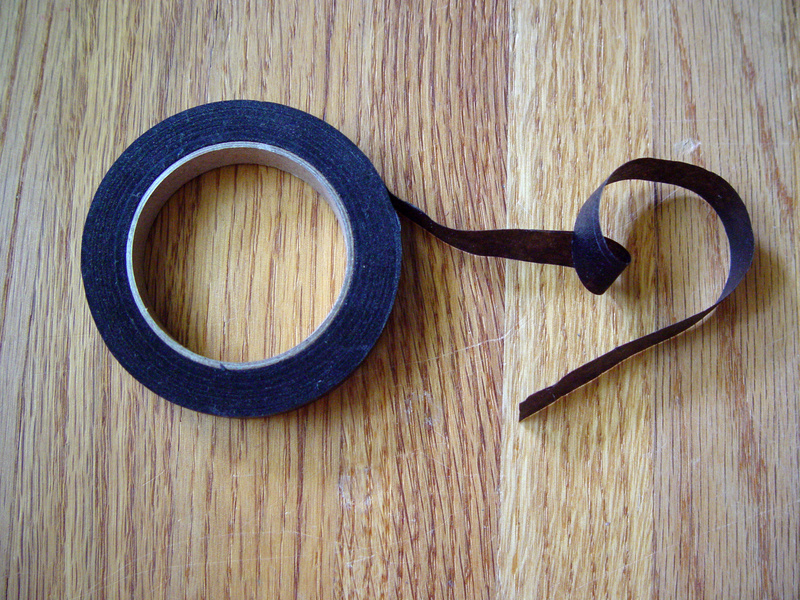 As you wrap the floral tape around your stem/wire, give the floral tape a little pull to stretch it out. It gives quite a bit and stretching it slightly will help get the tape tight around the stem. Don’t worry if you stretch it a bit too much and it breaks. Don’t undo what you’ve done, just start wrapping the tape again from where you are. 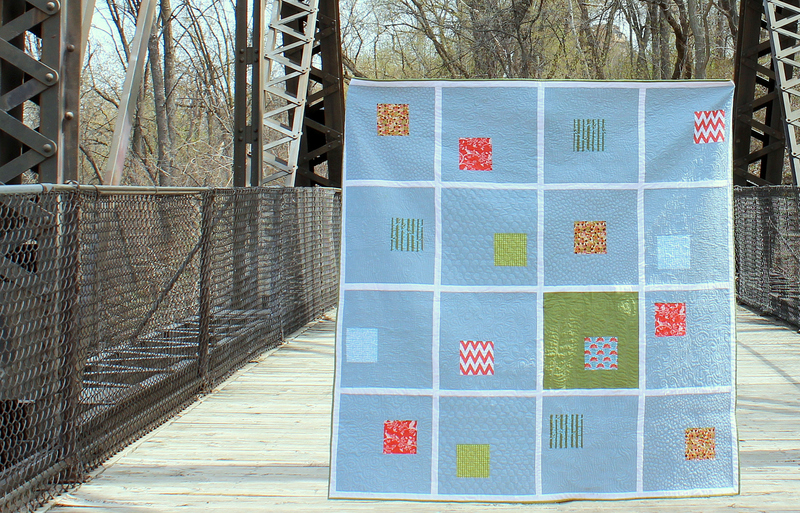 There’s a simple way to do this quickly, once you get the hang of using the floral tape. You can hold the flower in one hand and floral tape in the other and spin the flower in your hand (left hand in photo below) while you gently stretch and attach the floral tape with the other (right hand — hard to see floral tape, but it’s there). Keep going until you’ve covered all the wire. Using wire cutters, trim any extra wire. Continue with all of your flowers. Your hands will get pretty sticky from the floral tape, so you might want to wire all of your flowers first, then tape them. 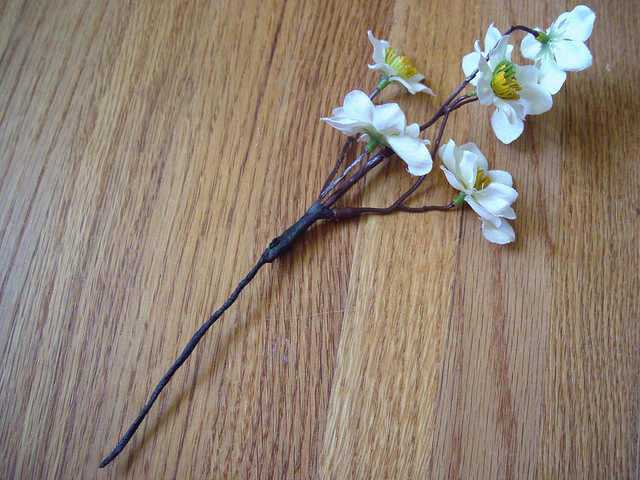 As I mentioned before, there’s a great deal you can do with your flowers once they’re wired. 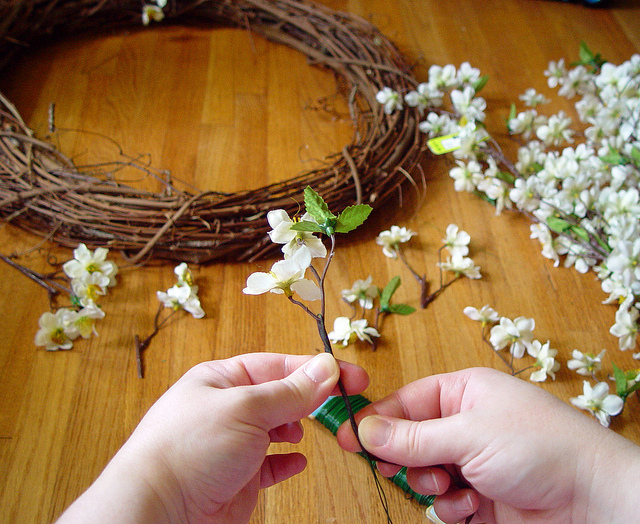 You can tape them together in larger bunches to make bouquets or tape them together into a circle to make a crown or wreath. 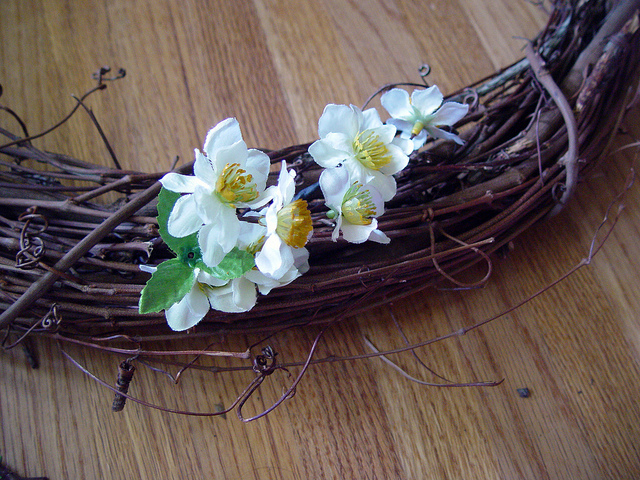 You can arrange them in styrofoam for a centerpiece or you attach them to a pre-made wreath. 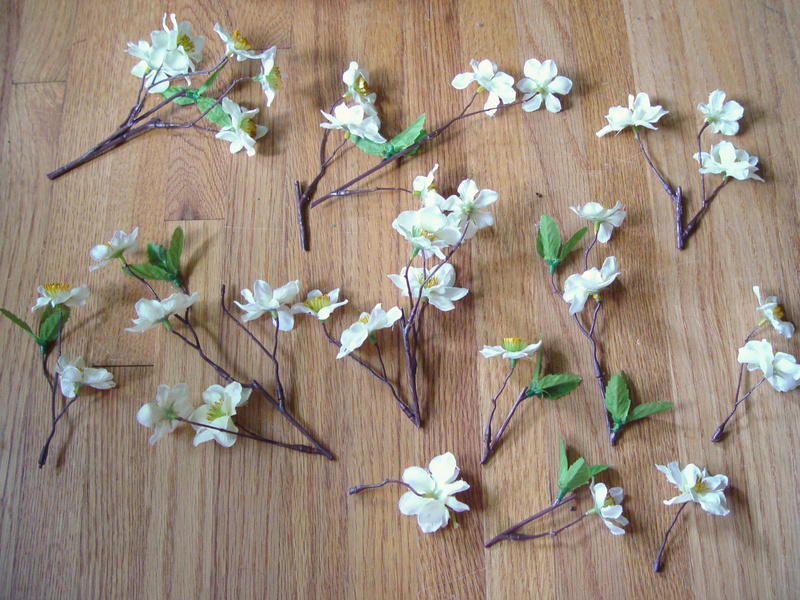 I’ll be attaching them to a grapevine wreath which will hang outside. There are many ways to do this — this is what I do. 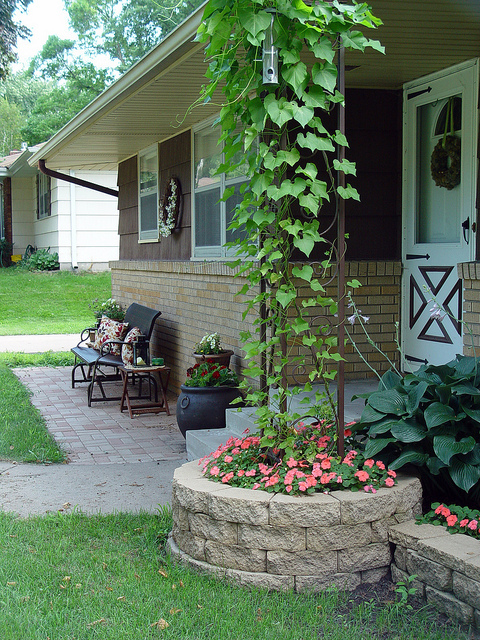 To start, just grab one flower stem and gently push it through the wreath. You’ll see the other end poke through the back. 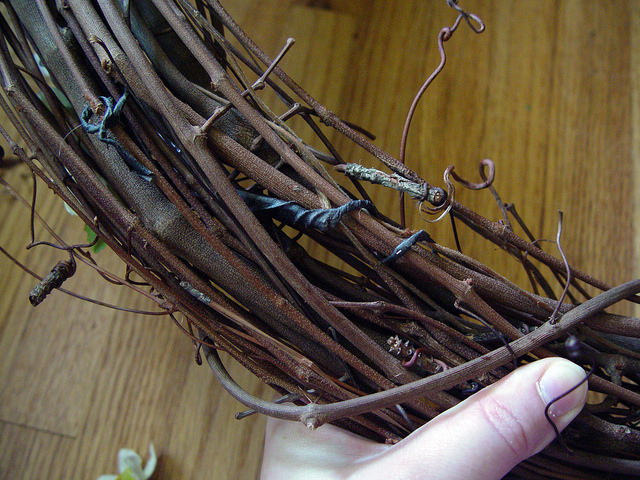 Wrap the end of the wire around the sticks of the wreath to secure in place. 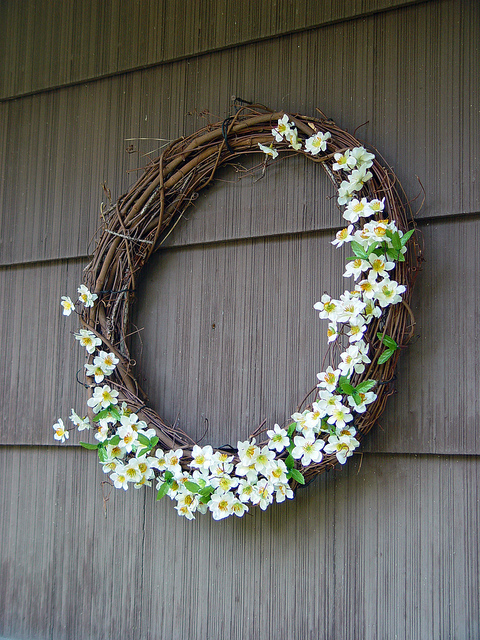 Continue until your wreath is covered to your liking. Finally if your wreath doesn’t have anything to hang it from, you can make your own hanger with a bit of your floral wire (I covered mine with my brown floral tape so it blends in). Just take your wire and wrap it around the wreath a couple times and make a little loop and secure it with a few twists. Thank you so much for this post. 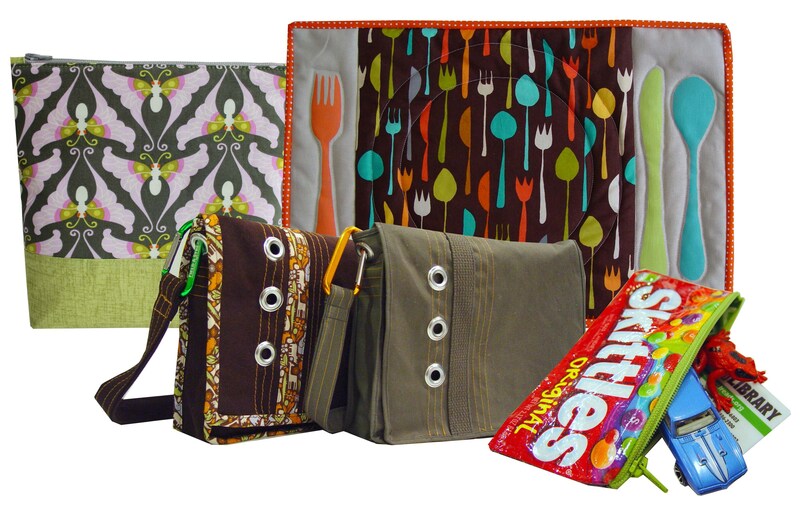 I want to let you know that I posted a link to your blog in Creative Busy Bee Craft Inspirations, under the Page 2 post on Aug. 25, 2012. Thanks again. Oh, thank you thank you thank you!! 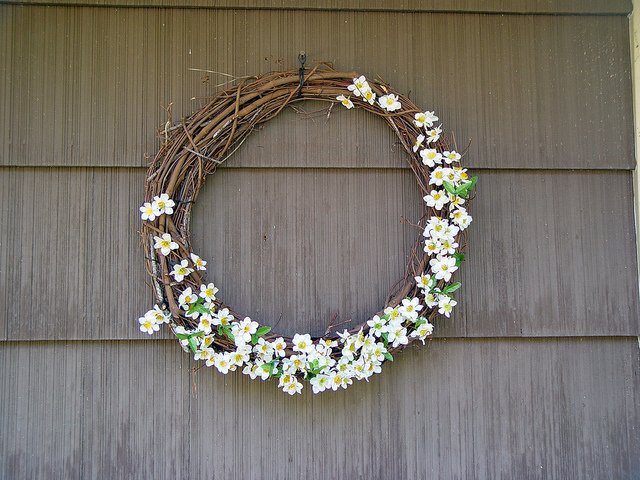 I have managed to get myself into a few projects involving making some wreaths. After a few hideous results, I thought surely someone can help me: Here you are! I am so grateful for this very well-photographed lesson! You answered all my questions, either with your words or a photo. 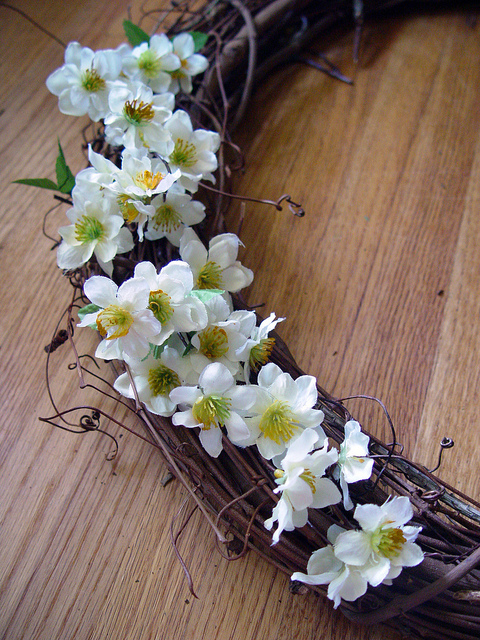 Well, except one question: How to wire a fake flower with multiple layers in one large bloom? I have approximately eleventy thousand poinsettias and I’m in big trouble! Thank you! Ok. I think I’ve figured it out. And I have learned my lesson: I will not be flippant and over-confident when someone asks for volunteers to make some wreaths. I am saying that with every poinsettia I dissect then wire back together. I am really liking the current style of very few flowers set assymmetrically. Yes, I think I’ll do that from now on!